Nathan Gardels, Global Viewpoint Network: In a recent report on “post-crisis growth,” you noted the resilience of China, which has bounced back to high growth after the Wall Street crash and is now officially the second-largest economy in the world. What are the key factors of China’s resilience? Will China be able to keep bouncing back, or might the recessionary winds from across the Pacific cool things down? Michael Spence: China—along with India and Brazil—is going to get through this crisis pretty well and will be able to sustain its growth in the years ahead. China in particular is capable of sustained growth if it can properly manage structural change in several dimensions. First, China is going through a “middle-income transition” in parts of the country as earlier “growth drivers” in the export sector, notably low-wage manufacturing along the coast, die off and must be replaced with other drivers such as services. The domestic consumer will have to become more important so there is a better match between the productive potential of the economy and domestic demand. Second, China is going to have to get quite a bit more income into the hands of the household sector to drive growth from within the domestic market. That means getting away from the very high levels of investment in the corporate and public sector, where the marginal return on investment is declining. Disposable income as a percent of GDP is low, and the savings rate is high, around 40 percent of GDP. Third, the Chinese have to get their current-account surplus down in the global economy or they will get a bad reaction from outside—protectionism, for example. If they can get the surplus down, that will help the global economy, but it will also help build domestic demand and household income. This is a complicated set of changes to navigate, but I believe the Chinese leadership is up to it. I’ve been able to listen in and participate in some of their internal discussions, and I think they are going in the right direction. Certainly there are interests that want to block these changes. But the same qualities that have enabled China’s resilience so far—a long-term horizon, decisive policymaking, and consistent follow-through by a generally competent government—bode well for the future. Because of their long-time horizon, there is a high level of understanding by the leadership that the economy has to evolve. Looking out at where they want China to be in ten or twenty years, they know that an advanced economy cannot be based, as China is today, on labor-intensive process manufacturing for export. They have seen how South Korea has managed the middle-income transition. I’m sure they are intensively studying that experience. Gardels: With a nearly 9 percent annualized growth rate, Germany has picked up as the bright spot, a saver and strong exporter among the indebted consumer democracies of the West. Yet some say this so-called “German miracle” is really “the Chinese miracle” since their dramatic recovery is mostly due to high-end exports to China. Are we seeing a “German miracle” from which the rest of the West could learn? 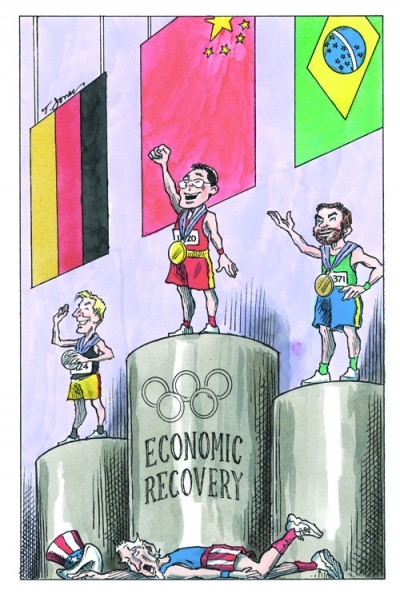 Or is it mainly due to a kind of “reverse coupling” where China is pulling Germany out of the doldrums? Spence: Germany is doing well for two related reasons. First, the export sector is very healthy. And that is the result of the fact that over the past decade Germany has gone through a major restructuring of its economy in which workers traded some income for more job security, greater flexibility of hiring and firing was allowed, and work-sharing instead of layoffs during the downturn has enabled key companies to retain skilled workers so they can get back on track quickly as demand rises. All of these reforms have put German companies in a more competitive position. Second, as we’ve discussed, major emerging markets from China to Brazil not only have restored growth but also are sustaining it. Germany’s export sector is in a strong position to take advantage of that. Gardels: Where do you come down on the global debate between whether it is time to cut back and move toward austerity versus continuing stimulus spending by governments? Spence: There are such large differences among countries that it is hard to come down on any one position. There is a difficult balance between maintaining enough support to avoid a deflationary downward spiral on the one hand, and the longer-term costs of high debts and deficits on the other. It is not surprising there is lively debate about this because there are good arguments on both sides. As far as the United States is concerned, I would be on the conservative side at the moment. On the fiscal stimulus side, we’ve done about as much as we can do. I’m very much in favor of extending long-term unemployment benefits because they are essential to protect people while at the same time providing a stimulus. If you are going to spend limited resources, this is a good place to do it. But, beyond that, the United States is in for a period of painful restructuring of balance sheets to deleverage decades of overspending by borrowing. That will take time to work through. I don’t think you can accelerate the recovery by further government spending. It just won’t yield much benefit. America has clearly not yet come to terms with the fact that a healthy long-term future depends on suffering short-term pain. As much as we might wish it, there is no painless recovery after such a long bout of overleveraging. That pain must involve both tax increases, partly to increase public-sector investment in infrastructure that has been way too low, and budget cuts in some government services to help further finance those same infrastructure investments. Tax cuts, only if they stimulate job creation, must also surely be part of the mix. What worries me most is that as we—so far, unsuccessfully—try to gather the political consensus to take decisive action, opportunities for the younger generation are shrinking. They are going to pay a high price in the short and medium term. Gardels: Fifty years ago, California made the kind of massive public investments—in a world-class university system, a vast road grid, and canals to bring water from north to south—that China is making today, from the world’s fastest trains to the cutting edge of clean-energy technologies. Yet, as we speak, California, like the United States as a whole, is mired in debt and political gridlock. Perhaps the Western consumer democracies, where the feedback signals of politics, the media, and the market all tend to steer society toward immediate gratification, could learn something these days from China? Spence: Yes, we could especially learn from the way they think about the evolution of the economy over the long term and then, in a pragmatic, non-ideological way, set about getting things done. Democracy makes it a much more complicated and time-consuming process to get from A to B, to build consensus, and to invest in and support those things that sustain long-term growth. It is not impossible to do that in democracies today, of course. Brazil has turned itself around, and India seems to be doing so. So there is something to learn from them as well. It doesn’t work that way. And it never has, even in the United States. It takes a commitment of resources and a long-term perspective. It is a bit like the way venture capital works. You don’t know exactly how things will unfold, but you have to have a portfolio of projects to try to create and capture emerging opportunities. In the developing countries that are successful, they think more in terms of a complementary relationship between the public and private sector. Gardels: Is there a cultural issue here? Do societies dominated by a consumer mentality have the political gumption anymore to save and sacrifice for the longer term? Spence: I’m not sure I understand the underlying forces that have led us to short-termism and underinvestment. But I do know changing that is above all a political process of building consensus for responsible governance. Those who think all you need to do is cut taxes and everything else will fall in place are wrong. For a country of our level of income and wealth, the state of the infrastructure has become an embarrassment. Why can’t we set a goal in America of having first-class infrastructure in fifteen years? Gardels: You said recently, “I have this gnawing feeling about the future of America. When people lose their sense of optimism, things tend to get more volatile. The future I most fear for America is Latin American: a grossly unequal society that is prone to wild swings from populism to orthodoxy, which makes sensible government increasingly hard to imagine.” You mentioned the tea party movement as one example. What can be done to prevent the United States from becoming like Latin America? Spence: I don’t know how to get there politically. But I imagine there is still a non-ideological middle in America that is patriotic but not overly nationalistic. We were once a very pragmatic nation, with the ability to compromise to move things forward. If we believe what we say—that America is the land of opportunity for all and that is why people want to come here—then we need the policies that will make that actually true. Many are worried about the stubbornly high U.S. unemployment rate, but believe we will get back to normal after the recession is over. But going back to where we were is not realistic. The emerging economies are going to be more than 50 percent of global GDP in the not-too-distant future. It is a changing world. We can’t afford to stand still and settle for endless political gridlock. I think the United States can change, but, to be honest, I just don’t see the political will at the moment. Reprinted by permission of the Global Viewpoint Network. © 2010 Tribune Media Services. All rights reserved.